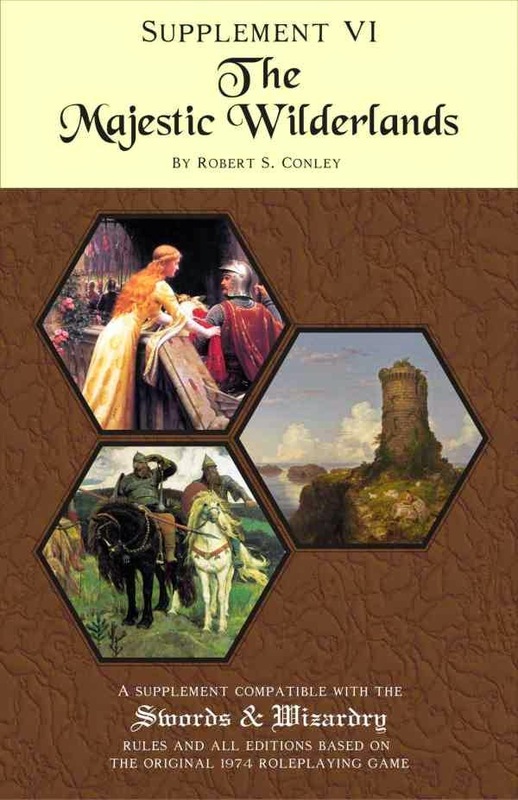 Joining the OSR Extravaganza with 15% off. Normally I don't participate in OBS general sales events like GM Day because I found they don't generate any more sales over just leaving it up at list price. However the OSR Extravaganza is different as it targets you folks directly. But because I don't have my join sales option turned on, I am not listed by OBS. Doesn't mean I can't run my own sales. So if you head over to RPGNow you will find the PDFs are marked off 40% individually and 15% off of the bundle price. So if you been wanting to pick up the Majestic Wilderlands or Scourge of the Demon Wolf, this is a pretty good price break. As for Blackmarsh the PDF is free and the print copy is only a buck and change over cost at $5. So no discount on Blackmarsh. In the previous post I talked about how I developed Scourge of the Demon Wolf. How does one get started with this type of adventure? Sourge of the Demon Wolf was developed during the course of one of my GURPS campaigns around 2000. 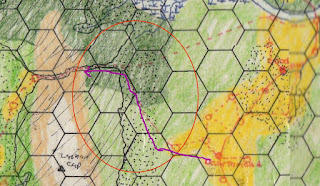 I knew the players were planning to travel along a specific road from the events of the last session. There was a small chance that something different would have occurred but given their goal the odds were high they were going to do. Remember that once a sandbox campaign gets going,it gets easier to predict the players are looking to do for the next session. Thinking of ideas I was inspired by a movie called the Brotherhood of the Wolf about the Beast of Gevaudan. Now I have a basic situation, a monster terrorizing the countryside. What the monster? A wolf of course, but abnormally powerful wolf. Where was the wolf doing this? That was easy for me as a lot of that region were medievalish manorial villages. So I picked one near the road the PCs were travelling on. Why is the wolf on a ramage? Here I diverged from my source of inspiration and picked something more suited for my campaign. To make the wolf more powerful I elected to have the wolf possessed by a demon. How did get it possessed by a demon? By a botched summoning! Who botched the summoning? A mage's apprentice greedy for power. Where was the apprentice's master? He was one of several living in a mage's conclave in the wilderness. Now I turned to who the demon wolf was terrorizing. I knew it was a fantasy medieval villages. So I came up wtih a reeve, a village priest, and added two characters for local color. A old guy who "minded" the local tavern and Yoluf a trapper that could act as a guide if the players hit it off with the Reeve. To connect the village to the mage I had the apprentice be sloppy and left much of what she used for the botched summon out at a site in the wilderness to be found. At this point I could have run it. But the situation would have been straight forward to resolve. If the PC elect to pursue the reports of wolf attack, they go to the village, do a bit of roleplaying, go out into the wilderness, maybe fight some wolves, find the summoning site, realize that mages are involved, find out about the local conclave and then head there. Another alternative they could just resolve it by main force and figure out a plan to kill every wolf in the area including the Demon Wolf. So in the next post I will explain how I complicated it. Just a heads up, Columbia Games has been running a series of sales on their PDFs for Harn. The latest is $5 for the Harnworld PDF which you can get through this link. Note that it automatically adds it to your cart so if you don't get it make sure you remove it. If you want to look at the product you can goto the normal RPGNow page through this link. I am not using any type of affiliate ID the one on the first link is for Columbia Games. There are other discounted PDFs that you can pick and you can see what are the latest by following this thread on the Lythia forum. 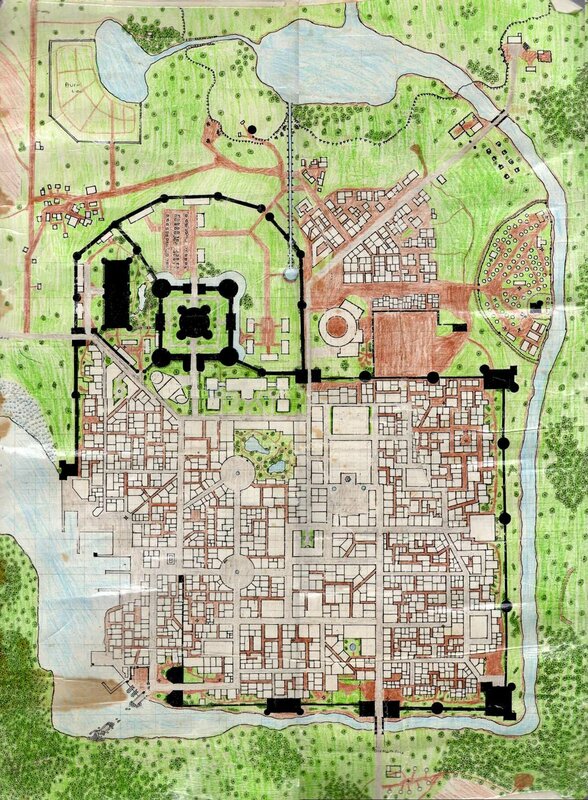 The individual articles, like Heru Castle, are often useful as resources for your campaign for when you need it a particular Locale and don't have time to generate one of your own from scratch. While writing the first book of my RPG project, The Lost Grimoire of Magic, I realized that too much of it was devoted to rules that will repeated among all the supplements. So I worked on a basic set of rules summarizing the system as a whole. So I got it down to 47 pages, and just as important should read as a coherent whole. 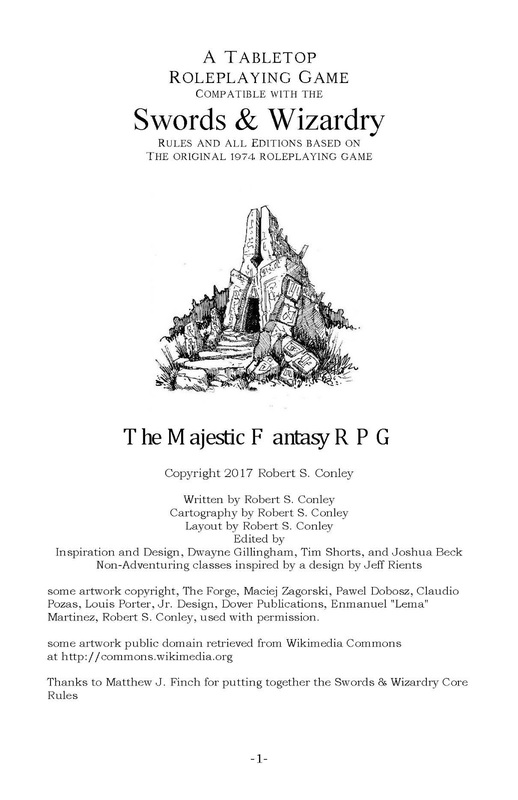 Basic Rules for the Majestic Fantasy RPG. Any comments and suggestions are appreciated, I have a forum thread opened up at this link. More generous with attribute bonuses but not as generous as the d20 SRD. Instead there a -1/+1 per three attribute points instead of per 2 like d20. Four Classses: Burglar, Cleric of Mitra, Fighter, Magic User. Four Races: Dwarves, Elves, Halflings, and Man. Man gets a +15% XP bonus on top of their prime requisite bonus. I played with the exact number over the years by gauging the reaction of players in choosing Man over the other races. For abilities, and spells, I jettisoned situational bonuses for the most part in favor of 5th edition's advantage and disadvantage. My opinion that is much easier to grasp by players than remembering whether you get a -4, -2, +2, or +4 bonus that it worth including. Plus the original edition never been big on stacking up modifiers anyway so I feel the loss of having a +1, +2, or +4 bonus (or minus) is not a big deal. Incorporated the ability system from the supplement. Basic resolution is still 15 or better on a roll of a d20. Any character can do any ability just that some are better at certain abilities than others. All classes have ability bonuses they can use. Rogue classes like the Burglar are built around ability bonuses. 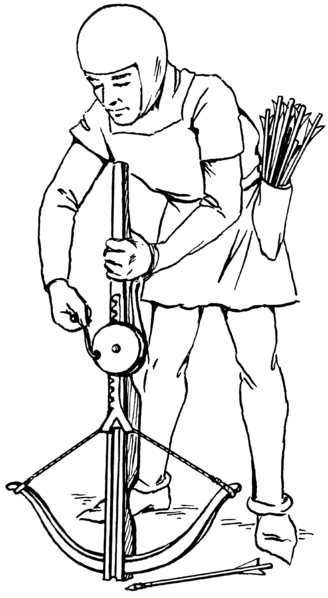 A short equipment but many pieces of equipment have one or two rules associated with their use. For example using a mace give you +1 to hit versus chainmail armor. The use of Shields have been fleshed out. The ritual rule allowing clerics and magic user to cast spells as a ten minute ritual plus a cost component has been carried over from the supplement. Magical Immunity works a bit differently from Magic Resistance. Basically Fireball, Lightning Bolt work as they do direct damage by creating something, Charm Person, Sleep, etc are effected by Magical Immunity. The resolution has been made into a d20 roll with the same odds as the original percentage based rolls. Spells note whether they are effected by Magical Immunity or not. In addition all uses of percentages been changed to d20 rolls with the same odds. Just saying if it going to be in 5% increments make it a d20 roll. There been some tweaks to specific spells like Sleep effecting 4d4 hit dice of creature max 4 HD effected. The combat system uses 1d6 individual imitative. A new wrinkle is that fighters get to add their to hit bonus. I allow two actions per combat round which can be summed up as a half-move and an attack. As a side note this is the oldest section of the rules dating all the way back form when I ran ADnD 1st in 1979, 1980. My stab at easy to use grappling rules. You successfully hit, your opponent is now grappled, if the opponent doesn't break free the next round, you have a number of options including damage. Combat stunts, the general idea is that you can opt to do something else other than inflict damage with a successful to hit roll. However the downside the opponent gets a saving throw which means high level or high hit dice is likely going to save. But if you are desperate it may be the best option in that round. No Monsters or Magic Items which will be presented as part of the various supplements. However anything from any version of Swords and Wizardry will work with these rules. Finally I kept an eye on how interdependent the rules are so you should be able to swap in how other handle things easily. For example initiative will work with group initiative, the combat system can be replaced with the one in the B/X rules. You can ignore my spell in favor the original edition text, etc, etc. Hope you find this useful for your campaigns and appreciate hearing your thoughts on these rules. In the last post I talked about my background in refereeing. As result of my experiences I found that I had to lot to write about sandbox campaigns. Stuff that people could get and use in their own campaigns like Points of Light and Blackmarsh. On my blog I worked on a series of posts about How to make a Fantasy Sandbox. One thing I didn't write about as much is what happens session to session, like the adventures I ran during a sandbox campaign. 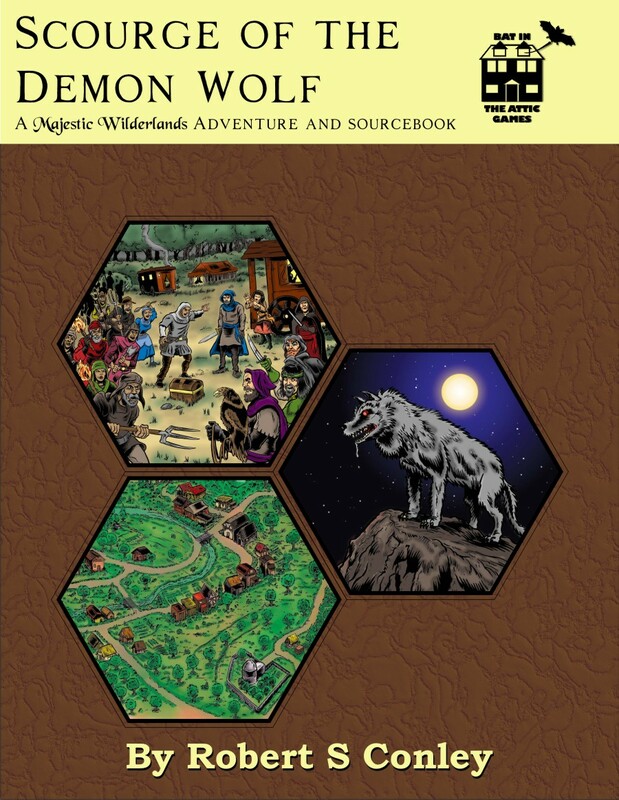 Scourge of the Demon Wolf is an adventure that represent what players typically deal with in my campaigns. One that allowed me to publish Scourge was that it was self-contained enough to written up so it was useful for other campaigns. Most of my sandbox adventures are highly situational based on the circumstances of the PCs involved. But occasionally something like Scourge happens and I can set aside my notes for further development. What makes Scourge a sandbox adventures? First off it is a situation that has the potential for adventure. The situation is driven by the interactions between the various NPCs. For Scourge it starts when an ambitious apprentice foolishly summons a demon. To the apprentice the ritual appeared not to have worked. So the apprentice returned the conclave where she was studying. But shortly after a weakened wrath demon from the Abyss emerged. Without the proper completion of the ritual, the Wrath Demon floated around as a spirit and possessed a nearby wolf pup. Thus the Demon Wolf was born. The area in which this occurs is a typical rural fantasy medieval setting. There is a village owned by a Baron and has a Bailiff and Reeve that work together to manage it. There is a crossroad hamlet nearby with a inn. More unusual is a conclave of mages living in a small compound just half day into the wilderness. There are also bandits that prey on caravans and a group of wandering beggars that occasionally travel through the area to smuggle stolen goods. Finally there is itinerant tinker that wander the area making a few pennies by selling small goods and doing repairs. 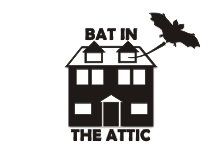 The Demon Wolf goes on a murderous rampage, people die, the Baron sends his huntsman who is outwitted, and finally in a second round of attacks the baliff of the village dies. The villagers refuse to bring in the harvest until the creature is killed. The Baron can't have this so sends the PCs to deal with the situation once and for all. There also a number of other hooks including the thieves guild sending somebody to find out why the bandits or beggars are not paying a cut of what they steal. How did this get written up? Most of the time author get an idea; write, refine, edit, and then finally get laid out as a book or PDF and published. This works for a lot of published adventures. But they suffer from the same problem as a movie or a novel, it hit or miss whether the hobby winds up liking it. Sure experience helps but still a roll of dice whether something catches on? Is there a better way of doing this? Or rather there is something we can do more. What I didn't mention above is playtesting. Because writing for RPGs is about writing for games, playtesting is part of the process. However how do you playtest? You get your draft into a semi-finished form and try it out a couple of times. Then use the feedback to tweak it from there. The problem I have with that process is the initial draft especially for adventures. Normally people lay out a rough draft from start to finish and use that as a starting point. A lot of the structure of the adventure is baked in. What if you took advantage of the fact that RPGs are a active form of entertainment and just started with a initial situation. You have NO idea how the adventure is going to conclude when you start the process. Would it be a more useful adventure for others to use in their campaign? By the time I decided to publish Scourge I ran it two times already. Once for GURPS and once for D&D 3.0. So I had a some information of on the things that PCs were likely going to do. But now I was going to publish it, I resolved that the final product would be in part a record of what the players do and not do in the various playtest sessions. And see if this really made for a better adventure. By the end of the process I have ran it over 8 times through my home region centered NW Pennsylvania and twice in other locations in the United States notably Morningstar Games in Savannah Georgia. By the sixth time I ran it I started writing, and was incorporating notes from the 8th and last time I ran the adventure. What did I wind up writing about? I wrote about the region, the locale, and the NPCs. The playtest helped pare down what I needed to write about. Then I consolidated common events caused by the PCs and wrote them up. I included notes about where things diverged. I made sure I included a one page summary to get the referee up to speed. The stuff I pared away I reformatted into a sourcebook. 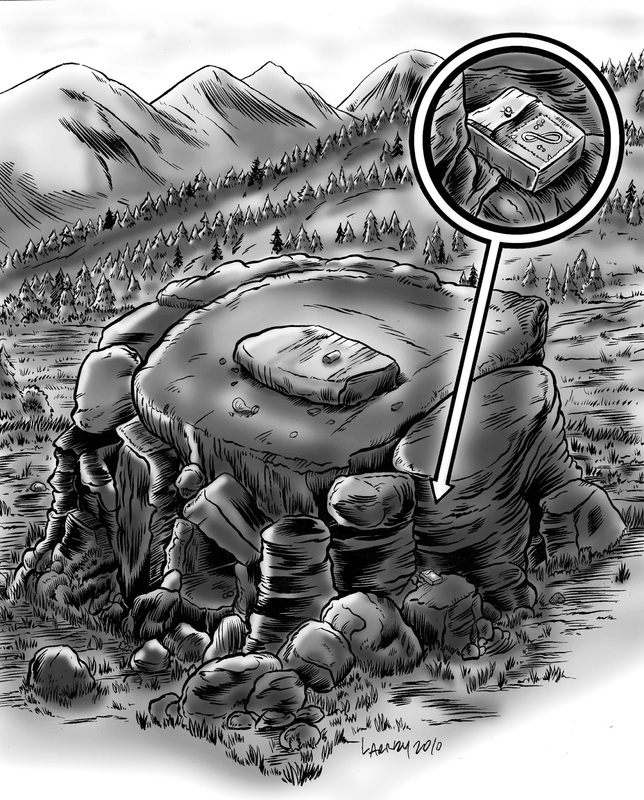 I laid the book out into two sections, the adventure and a small regional sourcebook that fully fleshed out each of the locales in the adventures. You can run the adventure with what in the first half. Then use the second half as part of your ongoing campaign. So how did sell? OK didn't burn down the RPG hobby by any means even by OSR standards. But creatively it was very sastifying and currently repeating the process for a couple of other adventures. Any downside? Yes time, it is very time intensive to do this. Not good if you need regular cash flow as a business. You couldget a pipeline going where you are playtesting all the time so when the first adventure is finished there always one more behind it almost done. Then you have to think of travel expenses for face to face. The rise of vritual tabletop software should make this easier. You could schedule periodic sessions and really rack up the playtest hours. But you are still going to need to do face to face as not all hobbyists can be found on-line. For me using my hobby time to develop this, it took me three years to rack up the eight playtests. Although in the third year, I slacked off the writing a bit too much I have to admit. Today I can probably do eight playtest in a year with two run face to face at a game store and/or convention and the others run on-line. Next time I will be talking about the creative process I used to develop the initial setup. Thoughts on Tabletop Roleplaying - Why? I run campaigns where the overall direction is set by the players. At the start of the campaign I setup the initial circumstances based on what the players want to focus on. Circa 1980 when I first started using Judges Guild Wilderlands of High Fantasy, I pretty much threw things out there and hoped for the best. Later I learned to talk to them beforehand about their goals. Note that is not a elaborate or formal process just something I know to ask as part of the back and forth banter that goes on before the start of any RPG campaign. What set my campaign apart initially was the fact that I had no problem with the players trashing the setting I created. Kill the King, Sheriff, High Priest or local merchant? Sure no problem. But player better think it through and come up with a decent plan because it will be a challenge and there will be consequences. In addition another thing that set me apart that the result of the previous campaign became part of the background of the setting for next campaign. At first it was just a novelty because the Wilderlands were a big place. But as time went on, more and more of the Wilderlands were affected by something the PCs were doing. And many places were affected by multiple parties especially the City-State of the Invincible Overlord. The original Wilderlands of High Fantasy were pretty light on the details of the world. It had local detail in abundance but not much on at the level of Kings, and Emperors. Over multiple campaigns set in the same setting, I started developing a consistent background of my own. Eventually around 1988, with my originals wearing out, I used what I learned in cartography as part of my geography minor to hand draw an brand new set of maps for my own use. 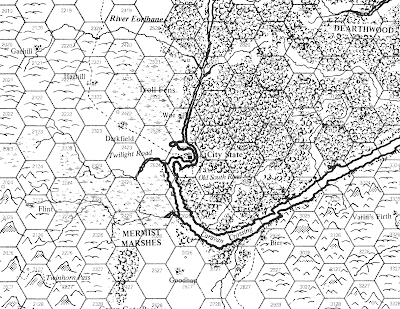 I expanded the scale slightly from 5 miles per hex to 12.5 hexes. 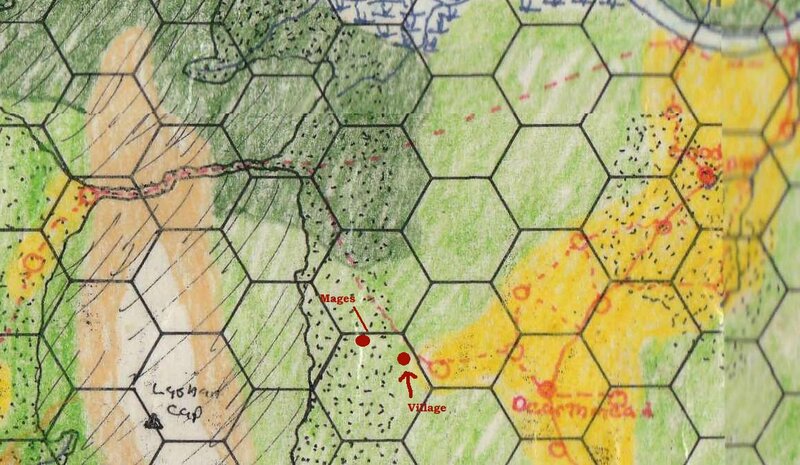 Adopted some ideas on cartography from Harn and from then on the Majestic Wilderlands started to come together. By 1988 I switched to GURPS. Rather then going off on a completely different tangent with the Majestic Wilderlands, I adapted the stuff I was doing with AD&D to GURPS. Sure there were differences as combat was deadlier, and more detailed. Character capabilities were more detailed and more flexible due to the point based system that GURPS used. But by and large players still explored dungeons to find weath and magic items, and still were trying to knock off kings, emperors, and merchants. Because of the flexibility of GURPS occasionally a focused campaign was run where everybody was a mage, or where everybody was a member of thieves guild. One of my favorites was one where everybody was a member of the city guard and characters started out with half the normal number of character creation points. The tactics and gear the players developed as a result of that campaign I still use today. 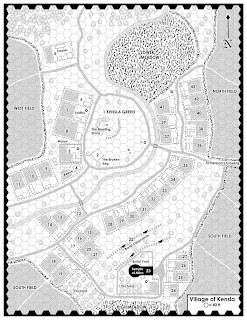 If you have my Majestic Wilderlands Supplement the Knight Killer Crossbow (page 4 in the link) was a result of that campaign. Another favorite was another low point character creation campaign where everybody was part of s small neighborhood in City-State. The highlight was the PCs successfully coming up with a plan to take out a vampire with blankets, pots, pans, and rope. And they succeeded. Finally in the 2000s I started using OD&D for my regular campaigns. I already had some experience with the system from the various hexcrawl formatted settings that I wrote like Points of Light and Blackmarsh. After reading Matt Finch's Old School Primer a bunch of things came together in my head that didn't happen when I first used AD&D. I saw how I could do with OD&D everything I was doing with other RPGs like GURPS but without the overhead of the more detailed mechanics. I still enjoy playing those RPGs but OD&D worked out as the better choice for the time I had. I started using it and eventually wrote up what I did in the initial sessions as the Majestic Wilderlands Supplement. This is why I run the campaigns I do when it comes tabletop roleplaying. Next I will talked more about the nuts and bolts of what I do namely how I setup and use sandbox adventures. 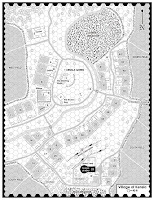 Over on RPGNow and DriveThruRPG Judges sells scans of the original maps. Many have commented on their poor quality. The reason for this is because they were made in the early 2000s by a fan who had access to a large format blueprint scanner. The problem is that the blueprint scanner could only scan black or white. The scan area under each pixel could register either only black in color or remain blank i.e. white. Even a decade later large format scanners that could do full color were rare. 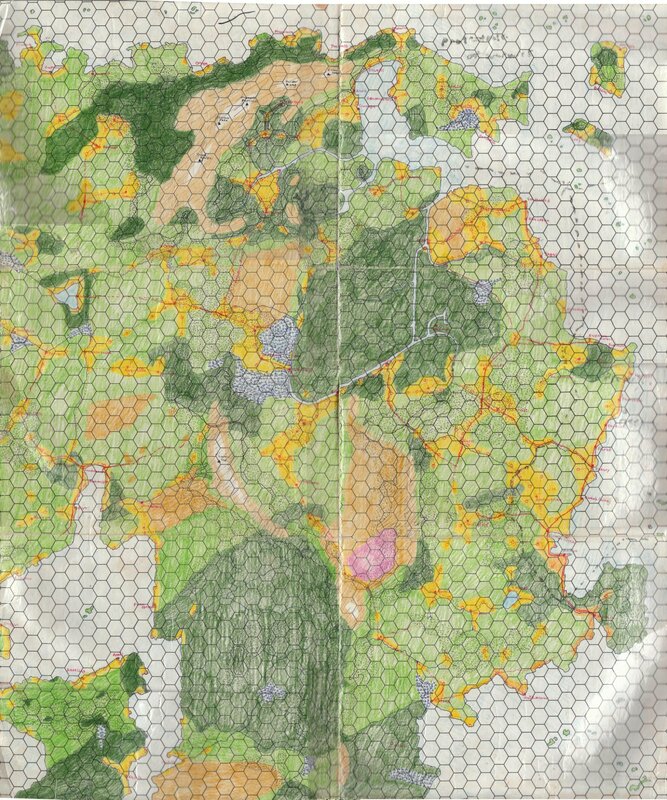 I tried to get my own hand drawn version of the wilderlands map scanned and the best I could do was greyscale. 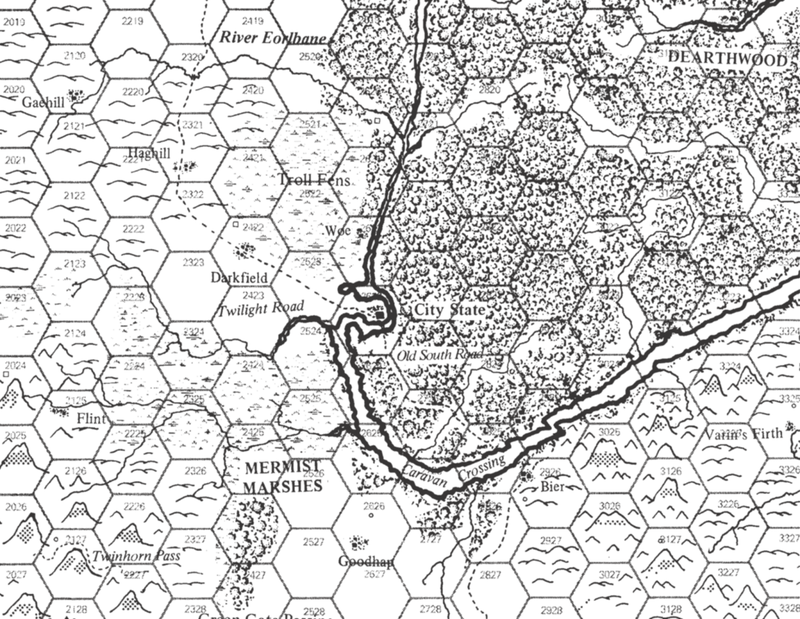 When I got aboard with Judges Guild and Necromancer Games, Bob Bledsaw sent me a CD of every scan they had whether it is maps or books. Most of the published maps were in there but not many books. The original scan looked like this. Somewhat readable. So what can one do to improve. Luckily the PDFs of the maps Judges Guilds allow you to export the map as a full resolution image if you have a program like Abode Acrobat or another PDF editor. I recommend saving this image as a PNG or TIFF. Once you have that image you can then using a image processing program like Gimp, Paintshop Pro, or Adobe Photoshop to blur the image ever so slightly. New version of these programs have an adjustable blur. I would keep bumping it up until the b/w cross hatching disappears. The map looks way better although you can detect the blurriness when you look close at it. I hope this helps with getting more out of your purchase of the original Wilderlands Map.